Just adjacent to the Skug Reservation, in Harold Parker State Forest, you can find a glacial erratic, which is an enormous stone monolith dropped here by the receding glacier at the end of the ice age. This erratic is sometimes used by climbers to practice elementary climbing techniques. Soapstone, or steatite, once quarried here is a soapy, greasy-feeling rock, very soft and easy to cut. It was used for tombstones, building stone, and small carved hand-warming blocks. Shortly past the mill and quarry in Harold Parker State Forest, the Bay Circuit Trail crosses in and out of the Skug Reservation, passing vernal pools and interesting rock formations along the way. Follow the BCT markers carefully at the intersections, eventually crossing a boardwalk to the Salem St. exit. The Bay Circuit Trail goes right very briefly and enters the Hammond Reservation across Salem Street. Follow trail about 0.2 mi., cross a small wooden bridge along a stone and earthen nineteenth century dike, and turn left into the Mary French Reservation. The trail contin­ues through an extensive wetland area bordering the Skug River via a wooden bog bridge and boardwalk and emerges on Korinthian Way. These sections of the Bay Circuit Trail are 1.1 miles. To continue on the Bay Circuit Trail, bear left up Korinthian Way, go right briefly on Gray Road and then left at the BCT marker. Here you'll enter a beautiful stretch of Andover Conservation Commission property that borders the Great Swamp, with good bird-watching opportunities as you walk. The Skug River was thought to have gotten its name from a phonetic mis­spelling of Skunk. An article by Eugene C. Winter in the Mass. Archaeological Society Bulletin (Vol 71-2), Fall 2010, convincingly shows that Skug was the Native American name for Snake. Over 200 years ago, its waters were dammed to power a pro?table sawmill and grist mill. The dam has long since washed away, but the massive stone walls of the millrace can still be seen in adjacent Harold Parker State Forest from the Skug River Reser­vation trail. William Jenkins quarried soapstone here, leaving behind the massive outcropping of wedged rock near the bridge. Mr. Jenkins was also a renowned abolitionist and his home on Jenkins Rd. was a station for the Underground Railroad and a gathering place for William Lloyd Garrison, Frederick Douglass and Harriet Beecher Stowe. The Reservations’ woodlands were once cleared farmlands. The stone and earthen causeway in Hammond Reservation was originally a dam, creating an ice pond and livestock watering hole. Hammond Reservation was named for Edmond E. Hammond, a former AVIS president, and was purchased with funds provided by Edmond Hammond, Jr. Deer hunting with bow and arrow from tree stands will be allowed on this Reservation during the state bow hunting season. For more information, see here. 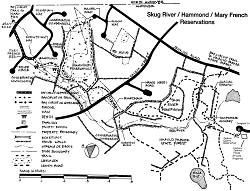 Between Salem Street to the North, Jenkins Road to the East, and Harold Parker State Forest to the South.